The first recorded owner of Heatherden Hall was Dr Drury Levin, and the second was the famous cricketer, K S Ranjitsinhji, after which the house remained empty for some time before being purchased, ‘early in the 20th century’, by Lt Col Grant Morden – a Canadian former multi-millionaire, and MP for Chiswick. He spent an enormous amount of money on enlarging and refurbishing the house and estate, and engaged James Pulham and Son to build most, if not all, of the garden features. Morden was sadly declared bankrupt during the great depression of the 1930s, however, and the house was purchased at a knock-down price by Charles Boot, a building tycoon, who converted it into a country club for the rich and famous. Boot’s dream, however, was to turn the land into a film studio. He renamed it ‘Pinewood’, and teamed up with millionaire J Arthur Rank to finance the project. Pinewood Film Studios continue to prosper to this day, and, fortunately, as far as this book is concerned, the gardens have been well maintained, and are almost the same now as they were when they were first landscaped by James 3. There is a balustraded terrace along the back of the house, and a formal garden containing an ornamental fountain. Beyond this is a small man-made lake, with rocky banks, a small island, and a boat cave at one end with a grass sunbathing patio on top. 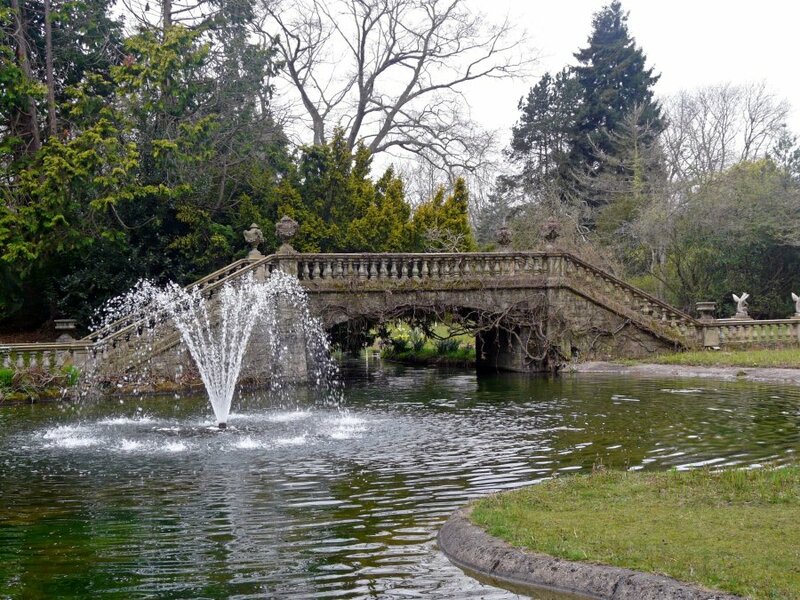 The main attraction here, however, is the beautiful ornamental balustraded bridge – pictured here – that spans the opposite end of the lake. One similar to this is illustrated in the Pulham Garden Ornament Catalogue, but that one no longer exists, so this may well be a unique surviving example. An additional ‘Chapter’ was published each month over a period of five years on this website under the tag of ‘Where? / Site of the Month’, and these can now be accessed alphabetically under the comprehensive ‘Where? / Gazetteer’ tag, so don’t miss those. Click on the link to see the complete list of Pulham sites described and illustrated by Claude Hitching. Another link that you might like to refer to takes you to the ‘Press and Media / Book Reviews’ tag, where you can read all the reviews of ‘Rock Landscapes‘ written by professional critics in the National and Garden Press. A full description of the work done by James Pulham and Son at Heatherden Hall / Pinewood – together with a number of pictures – can be found in Chapter 29 of Rock Landscapes: The Pulham Legacy – the critically-acclaimed and lavishly illustrated definitive story of the lives and work of James Pulham and Son. Written by Claude Hitching, with featured photography by Jenny Lilly. Published by Garden Art Press. Posted on October 4, 2014 June 30, 2016 by Claude HitchingPosted in Book ContentsTagged . . James Pulham and Son, Balustraded brudge, Boat Cave and Patio, Charkes Boot, Claude Hitching, Dr Drury Levin, Heatherden Jall, J Arthur Rank, K S Ranjitsinhji, Lt Col Grant Morden, Pinewood Film Studios, Rock Landscapes: The Pulham Legacy.